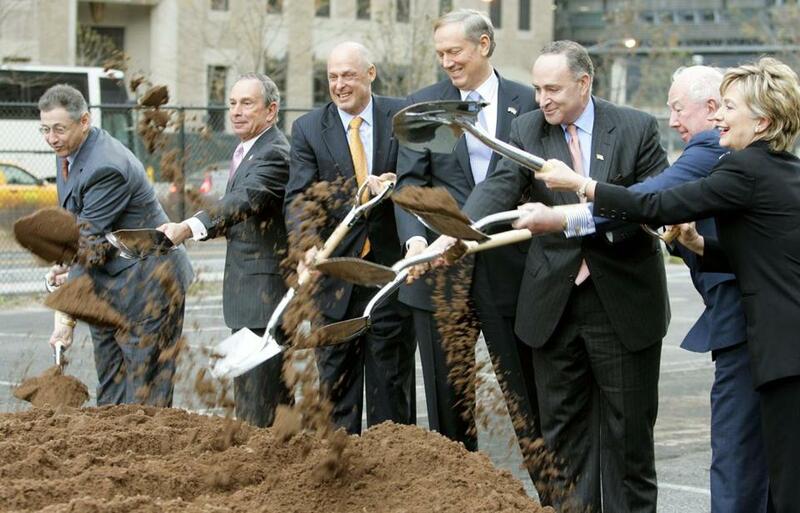 Hillary Clinton turned earth at the groundbreaking of the $2.4 billion Goldman Sachs headquarters in 2005. WASHINGTON — The financial services executive reached out to Senator Hillary Clinton’s office to discuss legislation that would affect banks. It seemed natural to make the connection: The executive represented some of the largest New York financial institutions. The call was quickly returned, excellent service provided to a professional watching out for the interests of the country’s biggest banks. But it wasn’t Clinton’s office on the line. An aide to New York’s other senator, Charles Schumer, called back. Yielding to Schumer on financial legislation was part of a pattern in the Senate when Hillary Clinton served there: She took a mostly hands-off approach to Wall Street regulation. With banks enjoying a new era of deregulation that her husband helped create, a neutralized Clinton represented a win for the financial services industry and its perpetual effort to free itself from Washington’s hand. The Boston Globe reviewed eight years of lobbying disclosure forms for the four financial services firms that donated the most money to Hillary Clinton while she was in the Senate. The review examined which banking and finance bills those banks cared the most about, and whether she took a position on them. The junior senator from New York rarely signed on to bills related to the financial services industry — whether the banks supported or opposed the measures. Of the 189 Senate bills that their lobbyists identified as significant banking or finance legislation, she cosponsored only 25. Of those, most of the ones she put her name on were also backed by Schumer — a member of the Senate Banking Committee who has never been known as an anti-Wall Street crusader. Clinton served in the Senate from 2001 to 2009, and the tail end of her career coincided with the nation’s biggest financial disaster since the Great Depression. Her state is home to many of the same large institutions that fueled the crisis and ultimately became the recipients of a $700 billion cash infusion designed to keep the banks solvent. Clinton voted for that measure. Her detachment in the years before the crisis was striking, considering Wall Street looms as an enormous industry in New York — and financial services employees were her biggest source of political money. Gary Gensler, a Goldman Sachs banker turned Wall Street reformer who serves as the chief financial officer for Clinton’s campaign, argued that Clinton took positions that bankers didn’t like in the Senate. Aides to Clinton point out that when Clinton was in the Senate, she never served on the Banking Committee, where much of the day-to-day work of overseeing Wall Street took place. Instead, the office focused her legislative efforts in areas that matched her committees. But as Clinton tries to fend off a populist challenge from Vermont Senator Bernie Sanders in the Democratic presidential nomination contest, her relationship with the financial services industry has become a key contrast in the campaign. Sanders has launched ads arguing that Clinton refused to stand up to Wall Street while he has been railing against big banks and big corporations for most of his career. “I have demonstrated the ability to have the backbone to take on Wall Street in ways that Secretary Clinton never, ever has,” Sanders said during the last Democratic debate in December. Aides to Clinton argue that there were few reform efforts percolating during the first few years that she was in the Senate and that only a handful of people understood the abuses on Wall Street. She’s claimed repeatedly that on the eve of the financial meltdown in December 2007 she went to Wall Street and told bankers to “cut it out” — a reference to a speech she made at the Nasdaq stock exchange where she asked bankers for voluntary concessions. By then, the crisis was already barreling down on the American economy. But for years she’d done little to make banks tremble. Instead, he — along with every other lobbyist interviewed for this story — trained their focus on Schumer, who sat on the Senate Banking Committee that oversaw many of the bills Wall Street cared about most. Former Treasury Department officials recalled a similar dynamic. Inquiries from Schumer’s office were frequent, but the officials were hard pressed to recall any issues Clinton cared deeply about. During Hillary Clinton’s first six years in office, the banks reaped the rewards of two massive pieces of legislation her husband signed into law as president, before she was elected in 2000: One was 1999’spartial repeal of the Depression-era Glass-Steagall Act, which had the effect of blowing up the wall between commercial and investment banking. Another, the Commodities Futures Modernization Act, ensured a deregulated market for derivatives, the sophisticated financial instruments designed to mitigate risk but instead contributed to the financial crisis. Financial institutions and their employees were Clinton’s biggest donors when she was in the Senate from 2001 to 2008. The top four banks were Citi, Goldman Sachs, J.P. Morgan Chase & Co., and Morgan Stanley. Over her career, the campaign committees for those four banks and their employees deposited $3 million in Clinton’s various campaign accounts, according to the Center for Responsive Politics. Those four banks — the ones that gave her the most campaign money — also spent $126 million lobbying Congress over the eight years Clinton served. One of Clinton’s earliest votes in her Senate career provoked the ire of Elizabeth Warren, who was then a Harvard law professor. Clinton voted with the big banks on a massive overhaul to the country’s bankruptcy laws, picking the financial services industry over consumers. Warren had met with Clinton about similar legislation in 1998. At the time, both women opposed the bill and Clinton pushed for her husband to veto the legislation. When asked about the 2001 vote at a campaign stop in New Hampshire, Clinton said she supported it because her colleagues in the Senate included protections she’d suggested for women seeking alimony. There were other fights. During Clinton’s Senate years, her colleagues were trying for reform proposals that banks spent millions of dollars trying to stall. One senator tried desperately to regulate Fannie Mae and Freddie Mac — but it didn’t go anywhere. Another pushed to give the Commodity Futures Trading Commission more authority. Clinton signed on to none of these bills, the record shows. Reformers don’t give Sanders a perfect score on Wall Street either. His big blemish: Sanders voted for deregulating derivatives when he supported the Commodities Futures Modernization Act as a member of the House of Representatives. Clinton’s pattern on banking bills changed in 2007 as she launched a presidential campaign amid the start of a financial meltdown. That year she showed more independence from Schumer, backing four banking bills that he’d avoided. Now her name was appearing next to Barack Obama and Bernie Sanders. She also introduced her own bill aimed at reining in Wall Street excesses. It aimed to cap executive pay — though only if a firm had to restate earnings because of financial irregularities. None of her colleagues signed on to it, and it never left the Senate Finance Committee. On the stump as a presidential candidate in 2007 and 2008, Clinton ramped up the rhetoric. She blamed the Bush administration for the growing crisis, accusing them of being “asleep at the switch” in a December 2007 speech at the NASDAQ stock exchange. The address outlined concessions she wanted from the financial services industry and included a rare public threat: “If we cannot reach a voluntary agreement, I will consider legislation to address the problem,” she told the bankers. Her experience picking fights with bankers was thin, but there was one exception to her laissez-faire posture toward financial services institutions. It came early in her tenure, in December 2001 when she, along with Republican Senator Wayne Allard, introduced a bill that favored real estate brokers over bankers. It would have reinstated some of the limits that her husband had cleared away when he partially repealed the Glass-Steagall Act: Banks would be prevented from entering the real estate business under the terms of the bill. Citi, Morgan Stanley, and J.P. Morgan Chase all opposed the measure — lobbying against it every year it was introduced. Despite their muscle, the legislation passed in the House.